For what it's worth, today is Tuesday, September 4th, less than two weeks away from the scheduled opening of Planned Parenthood's abominable Aurora abortion clinic. On the one hand, the pro-lifers' fight against this evil spirit has been incredibly successful. 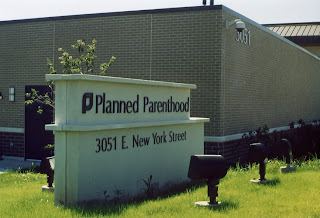 The recent overflow pro-life showing at Thursday's Aurora City Council meeting drew a promise from Aurora Mayor Thomas (don't call him "Weis") Weisner to investigate the shady way Planned Parenthood got an abortuary building permit. And of course, in Saturday's "Youth for Truth" Rally (see video) over 500 courageous teens (accompanied by 200 parents) made their youthful voices of protest ring true. Note that by the time Saturday's protest rolled around, the opposition had totally given up on counter demonstrations, as, like the leader, Lucifer, they employed his oft used strategy, "he who fights and runs away lives to fight another day." But make no mistake; the evil one still lives here lurking in the shadows, ready to open that clinic no matter what we say or do. For he knows, that despite our numbers, with the law of the land still on his side, it is not a fair fight. Proof of this is Mayor Weisner's promise after the city council meeting "to open a thorough and independent investigation" about how Planned Parenthood hoodwinked the Aurora City Council (several of which are pro-lifers) into granting an abortion mill permit. Unfortunately to head this investigation, he appointed Attorney Richard Martens, who as Eric Scheidler noted, "not only was a former partner of the law firm Klein, Thorpe and Jenkins which ... represented the city in the very planning and development issues that will be under investigation," but who also "still shares office space with them at 20 N. Wacker Drive in Chicago." In other words, Martens is hardly impartial. Couple this with the fact Martens said he plans to conclude the investigation no later than September 12th, not only "clearly contradicts" the mayor's personal assurance to Scheidler that the investigation "would have no deadline," but makes the whole process a farce. Of course, Scheidler is fighting this with his own lawyers, but you can at least catch a glimpse (if not get a whiff) of the "Powers and Principalities" we are up against. So I give you the remaining battle plan, so you can join in when you can. Besides the ongoing 40-Day Prayer Vigil, Friday, September 7th brings Joliet's amazing pro-life bishop Peter Sartain to Aurora to lead a Candlelight Vigil concluding a day in which he called for Diocesan prayer and fasting. On September 9th there is a planned Jericho March (see Joshua 6:1-20) around the Planned Parenthood block every night for the next week. September 11th (ironically) is the next meeting of the Aurora City Council, and lastly, on Tuesday, the 18th, from midnight to 8 a.m. (the exact hour the clinic is scheduled to open), there is a Husbands, Fathers and Sons Vigil hosted by the Knights of Columbus, the last ditch effort to keep abortion out of Aurora. Clearly, the time is now. So put on your "breastplate of faith and love, along with your helmet of hope" (see 1 Thes. 5:8) and join the fight. The future of Illinois' (and the world's) unborn depends on you.